Our evidence-based analysis on bacopa monnieri features 91 unique references to scientific papers. Bacopa monnieri, commonly known as water hyssop, is an herb often used in Ayurveda. Supplementing Bacopa monnieri has been shown to improve cognition, by means of reducing anxiety. It is also reliable for improving memory formation. Though effects of this nature are usually studied in the elderly, Bacopa monnieri appears to affect young people as well, making it a useful nootropic. Since Bacopa monnieri is also an adaptogen, a relaxed person might experience a lack of motivation to work after supplementation. Theoretically, pairing Bacopa monnieri with a stimulant would ward off malaise, but this combination has not been tested. Taking Bacopa monnieri on an empty stomach may cause nausea, cramping, bloating, and diarrhea. You are now following Bacopa monnieri. You will be notified when any significant update is made. Bacopa takes time to work. Studies that are too short tend to note either lesser or no effects, and studies that take multiple measures note that improvements are much better at 8-12 weeks than they are at 4-6 weeks. Anxiolytic effects might be acute though; its just the cognitive enhancement that seems to take time. The standard dose for Bacopa monnieri is 300mg, assuming that the total bacoside content (the active compound) is 55% of the extract, by weight. Bacopa monnieri can also be supplemented in a leaf or powder form. To achieve the ideal 10-20% of bacoside content requires a dose of 750-1,500mg of the leaf or powder. Historically, Bacopa monnieri was consumed with ghee, a clarified butter that originated in India. Since Bacopa monnieri is fat soluble and requires a lipoid transporter to be absorbed, it should be supplemented alongside a meal. The Human Effect Matrix looks at human studies (it excludes animal and in vitro studies) to tell you what effects bacopa monnieri has on your body, and how strong these effects are. Bacopa monnieri (of the family Scrophulariaceae) is a creeping marsh plant used in Ayurveda for neurological rejuvenation, and has implications for memory enhancement and anxiety. It is one of the more well renowned herbs alongside Ashwagandha and Jatamansi, and is most commonly referred to as Brahmi (although it may also be called Jalabrahmi since the term Brahmi may also refer to a particular combination of bacopa monnieri and Gotu Kola). It is classified as Aindri due to its neuroactive properties and as Medhya Rasayana due to its rejuvenative properties on the nervous system. The main traditional usages of Bacopa Monnieri are for anxiety, depression, learning, and 'various neuropharmacological disorders' whereas it has also been used for antiinflammatory, antipyretic, astringent, laxative, cough, poisoning, and blood disorders. It has traditionally been given to children as well to boost brain power. Bacopa Monnieri is commonly consumed with some form of animal fat, which goes in line with the herb's fat solubility. Many times, it is paired with the herb Centella Asiatica, known as Mandookparni or Gotu Kola. The pair is sometimes mixed in milk and drank, which is supposedly a common method of delivery for children. The total phenolic content of Bacopa Monnieri appears to be 3.18ug/mL for the ethanolic extract and 3.71ug/mL for the aqueous extract. The flavonoid content was 115ug/mL in ethanolic and 85.63ug/mL in aqueous. These compounds confer anti-oxidant capabilities to Bacopa, and of relatively equal potency to that of Mandookparni. Upon acid hydrolysis (of which includes gastric digestion) the parent Bacosides break down into three subcategories. Thus, the bioactivity of the above 14 compounds is what is generally referred to as 'Bacosides A and B'. About one third of the total above weight is Bacopaside I. All bacosides and bacopasides share a similar base structure, but vary due to different functional groups attached to the 'R' denotations on the diagrams below. Functional changes on the sugar moieties can change the effects of the glycosides as well. Of these, the most bioactive components appear to be Bacoside A3, Bacopaside II, and both (jujubogenin and pseudojujubogenin) Bacosasaponin Cs. Temperatures of 40-60°C (104-140°F) appear to be able to slowly degrade Bacopasides over time, whereas heat exposure up to 80°C (176°F) can rapidly decrease Bacopaside content. Proper storage of Bacopa Monnieri is at 30°C (86°F) or less, with a relative humidity of 65% or less. In the stomach and at doses ranging from 10-100mg/kg bodyweight, Bacopa Monnieri extract (via the Bacoside A component) appears to protect against ulcers induced by drugs (aspirin, alcohol), stress such as cold-shock and Heliobacter Pylori bacteria. Some repair of the stomach lining has been noted. When tested in vitro, bacopa monnieri extract has been noted to have noncompetitive inhibitory actions on CYP1A2 (IC50 of 52.20µg/mL), CYP2C19 (IC50 23.67µg/mL), and CYP2C9 (IC50 36.49µg/mL) while possessing competitive inhibition of CYP3A4 (IC50 83.95µg/mL). The inhibition of CYP2D6 was low in potency (IC50 of 2mg/mL), and the inhibition of the first four CYP enzymes are thought to be practically relevant for oral ingestion as intestinal (but not liver) concentrations of bacopa (assuming a 300mg a day dose) are estimated to be around 600µg/mL and this concentration is sufficient to reduce activity to below 10% in vitro. 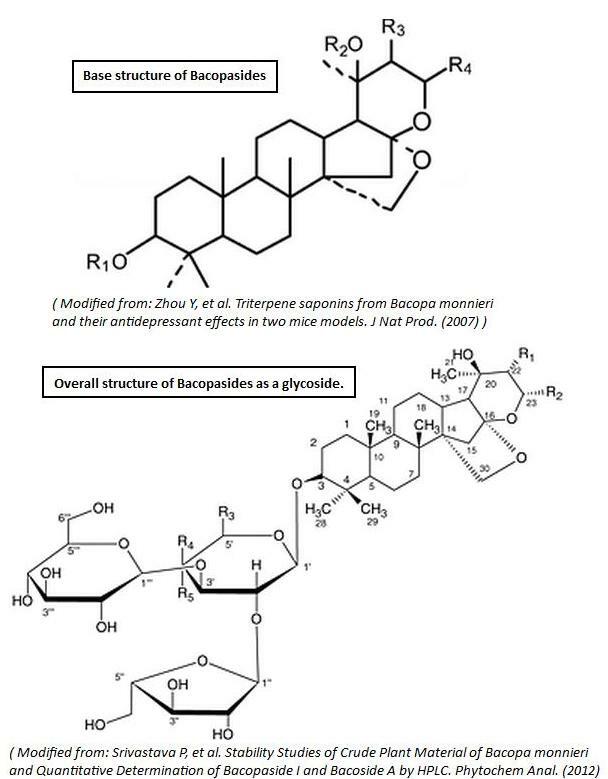 When tested in isolation, select bacosides (bacoside A and A3, bacopaside I, II, and X, and bacopasaponin C) failed to have any inhibitory actions towards any CYP enzyme. Bacopa Monnieri extract may be able to increase memory formation by the enzyme Tryptophan Hydroxylase (TPH2) and increasing the expression of the serotonin transporter (SERT). Bacopa does appear to have some interactions with the serotonin system, and may have downstream effects on the cholinergic system through this. Additionally, dendritic intersections and branching points in neurons have been noted to be proliferated with Bacopa Monnieri supplementation after 4 and 6 weeks, but failed to have any changes at 2 weeks. This neuronal growth effect occurs in adult rats and younger rats undergoing growth spurts, and occur in areas of the brain known to be involved with memory, such as the hippocampus and the basolateral amygdala. These changes coincide with memory enhancement seen in human studies, where usage for under 2 weeks is not associated with any cognitive enhancement but additional usage is; implicating dendritic enhancement as a probable explanation for memory enhancement. Bacopa, in healthy persons, has been successful in beneficially affecting the retention of learned information. It may be able to reduce the rate of short term forgetting (ie. increase encoding of information) while increasing retention speeds. In addition to rate of learning, Bacopa Monnieri shows some promise at 300mg daily for improving memory, verbal learning and delayed recall. This has been repeated in healthy persons between 18 and 60 with two doses of 150mg daily. In regards to persons with impaired memory, low dose Bacopa (125mg daily) appears to be somewhat effective. Bacopa has also been implicated in helping children aged 6-12 with ADHD, but this study used a blend of other herbs (Melissa Officinalis, Centella Asiatica, Paeoniae Alba, Ashwagandha, and Spirulina Platensis) and causation cannot be placed on any in isolation. These two studies are less able to be extrapolated to healthy persons, but should still be noted. Not all research is conclusively solid, as some studies do note no difference from placebo at therapeutically relevant dosages, although this study was critiqued on suggesting that the null results were due to 'low doses'. The former study was conducted at 300mg Bacopa and 120mg Gingko for 2-4 weeks, which is shorter in time to other studies but at a similar dosage. Beyond this study, one other study has noted no effects with a single administration, suggesting that longer term supplementation is needed. Many of these studies have been subject to Meta-Analysis, where it was concluded that Bacopa shows preliminary efficacy in improving general memory (9 out of 17 measured parameters) with little influence on other parameters of cognition. In a study analyzing the comparative effect sizes of Bacopa, Panax Ginseng, and Modafinil it was found that although Modafinil and Bacopa were both potent they were at different parameters; Modafinil increasing speed of information processing much better than Bacopa, which tended to reliably increase cognition after chronic dosing. Beyond enhancing memory, Bacopa has been implicated numerous times in reducing amnesia (memory loss due to stressor) via a collection of mechanisms. In regards to cognition (not memory per se), Bacopa at 450mg daily for 3 months has failed to significantly improve performance on an Inspection Time Task (discrimination) and on a Stroop test (attention and interference). 450mg Bacopa daily for 3 months in otherwise healthy persons has failed to significantly influence performance on a Rapid Visual Information Processing task (RVIP). Bacopa has some implications with serotonergic signalling in models of epilepsy (See Epilepsy subsection of Neurology) where receptor kinetics are normalized under the influence of 150mg/kg Bacopa Monnieri oral ingestion in pilocarpine-induced epilepsy. Beyond that, Bacopa Monnieri has been found to increase serotonin levels in the hippocampus of treated animals  as well as increasing the Serotonin Transporter (SERT). At 20-40mg/kg bodyweight Bacopa, Bacopa Monnieri appeared to increase SERT mRNA expression, but both the increases in SERT expression, Tryptophan Hydroxylase activity, and serotonin levels appear to decline with age, where rats that are 53 days postnatal do not experience increases in either, whereas 19 and 27 days postnatal still experience increases. In this study, memory was not tested across the age spans. Bacopa Monnieri has been investigated for its ability to reduce dopaminergic neuronal death seen in Parkinsons diseases, as evidenced by a genetically transfected C.Elegans line and mouse brains. Treatment with Bacopa Monnieri at 40-80mg/kg bodyweight in rats subject to both acute and chronic stress (to assess Bacopa's adaptogenic effects) found that the depletion of dopamine and serotonin associated with chronic stress did not occur with Bacopa supplementation, although the decrease in noradrenaline was unaffected. This preservation of dopamine levels has been seen with rotenone-induced neurotoxicity, which should normally deplete dopamine but doesn't in the presence of Bacopa Monnieri. Through these studies, it is plausible to suggest that Bacopa reduces stress onto dopaminergic neurons that would otherwise then deplete dopamine, although the mechanism of protection is unknown. Bacopa has also shown anti-dopaminergic effects in the striatum (location associated with caffeine and morphine, and highly associated with dopamine induced locomotion) and prevented surges in dopamine when fed at a low dose of 5-15mg/kg bodyweight daily. This anti-dopaminergic effect may be useful in situations of drug dependence Additionally, one study measuring levels of dopamine in the hindbrain noted statistically significant (91% of control). One study measuring hindbrain levels of acetylcholine noted an increase to 110% of the control rats. Bacopa Monnieri also appears to have anticholinesterase properties by inhibiting the acetylcholinesterase enzyme, but an IC50 value could not be calculated as 50% inhibition was not observed; thus these effects may be either weak or irrelevant. It has been implicated in reversing amnesia induced by anti-cholinergic drugs (scopolamine) at 120mg/kg oral ingestion, both retrograde and anterograde amnesia, which is the first study to link previous literature on amnesia to cholinergic transmission. Interestingly, this study ran for 7 days only and did not note any benefit to normal acquisition or retrieval of memory (in line with previous reports suggesting up to 2-4 weeks are needed for effects), suggesting the mechanisms behind reversing amnesia are distinct from that of inducing memory promotion. Other protective effects, such as a decrease in neuronal death in an animal model of Alzheimer's disease, have been noted. 40mg/kg of bacopa monnieri ethanolic extract did not appear to significantly influence levels of glutamate (despite beneficially influencing memory formation). Furthermore, bacopa monnieri does not appear to protect neurons from glutamate-induced neurotoxicity at concentrations able to preserve the cell from beta-amyloid toxicity. In a rat model of schizophrenia, administration of bacopa was able to increase concentrations of the vesicular glutamate transporter type 1 (VGLUT1) which was associated with improvements in the discrimination ratio and in epileptic rats the decrease in the metabotropic glutamate-8 receptor mRNA expression and NMDA R1 are nearly normalized to control. Bacopa has been shown to have various benefits in the treatment of epilsepsy such as reducing convulsion occurrence (Brahmi Ghrithan is Bacopa Monnieri paired with Ghee). It seems to exert these actions, in part, via changes in the GABA receptor subtypes in the hippocampus and striatum which may be due to the Bacoside-A content and are mediated through reducing the activity of the PNS. Bacopa Monnieri has also been shown to upregulate expression of a certain type of presynaptic glutamate receptor, mGluR8, which is downregulated during epilepsy. mGlu receptors are believed to be a protective mechanism from excitotoxicity, and their downregulation is concurrent with hyperexcitation. Despite downregulation of mGluR8 in pilocarpine-induced epilepsy, Bacopa Monnieri at 150mg/kg daily for 15 days was able to upregulate mRNA transcription rates of mGluR8 to near control levels and this has been confirmed by other researchers. Similar to downregulation of mGluR8 in epilepsy, Serotonin receptors (5-HT2C subset) are downregulated in the cerebellum during epilepsy and promptly reversed by Bacopa Monnieri, and upregulated in the hippocampus during epilepsy and also reversed by Bacopa Monneri. Both of these studies on serotonin receptor binding were done by the same research group and released within a month of each other, and using 150mg/kg dry weight Bacopa leaves. When Bacopa was fed to control rats without epilepsy, no effects were seen on 5-HT2C receptors. Bacopa Monnieri, at 40mg/kg bodyweight in rats, has been noted to modulate the stress response rather than merely suppress it. When Bacopa was administered at 20-40mg/kg bodyweight, an increase in HSP70 was noted (15-17% in hippocampus, 44-51% in cortex, 65-83% in cerebellum) when the stress was not applied; these changes were not statistically significant, and were numerically about a third the HSP70 stress response invoked by perceived stresses without Bacopa Intervention. The authors hypothesized that Bacopa induced gene expression of stress, which prepared the rats for the perceived stress and minimized its potency. When measuring PROD (7-pentoxyresoruﬁn-o-dealkylase) and EROD (7-ethoxyresoruﬁn-o-deethylase), Bacopa monnieri at 20 and 40mg/kg seem to elevate it to the same extent that stress does, but Bacopa ingested during stress appears to return PROD levels closer to baseline; reasons unknown. In looking at neurotransmitter levels, Bacopa Monneiri (40-80mg/kg) is able to reduce changes seen with dopamine and serotonin when a short-term stress is present, but is ineffective at preventing a rise in adrenaline; in chronic stress, Bacopa can prevent reductions in serotonin, dopamine, and adrenaline and was equally effective as was American ginseng (Panax quniquefolium) at 100mg/kg, similar to their comparisons on depression and anxiety. At least one acute study using 320mg Bacopa Monneiri extract (CDRI 08) has noted that Bacopa acutely enhanced performance in a Cognitive Demand Battery (CDB) of tests. This study noted that while Bacopa failed to acutely influence fatigue or stress at this dose it attenuated the rate of performance decline associated with CDB (usually attributed to neural fatigue). Bacopa has been noted to, in rats, reduce Superoxide Dismutase (SOD) levels by 2.4-fold in the hippocampus at 20mg/kg oral ingestion, without significantly affecting other areas of the brain. This study had measurements at day 7, yet it appears that testing later at 2-3 weeks (coinciding with when memory enhancement is seen in humans) SOD levels, as well as other anti-oxidant enzymes such as glutathione peroxidase and catalase, are increased in the hippocampus as well as other brain regions such as the frontal cortex and striatum. Bacopa Monnieri supplementation can reduce oxidative damage from aluminum and prevent an increase in cognitive iron stores in cases of overload. These effects are also seen with mercury, in which Bacopa Monnieri appears to reduce oxidative damage from mercury on brain tissue in vivo where near pre-testing levels of damage were achieved with 40mg/kg bodyweight, although full protection was not seen. In general, Bacopa Monnieri appears to protect the brain from the damage induced by excessive mineral status. There was a past contamination of mercury related to Bacopa Monnieri, but is atypical; Bacopa Monnieri supplements do not tend to have mercury contamination. Bacopa Monnieri has been implicated in reducing neural inflammation associated with aging over a period of three months, and may exert a neurological anti-aging effect. Bacopa Monnieri at 200mg/kg (large dose) was associated with IL-1β and TNF-α being reduced in older age (22% and 25.7% less IL-1β and TNF-α, respectively, in the Bacopa treated groups) and having the elevation associated with aging suppressed in all experimental groups. IFN-γ was not significantly affected. These anti-inflammatory effects have been seen in vitro and is attributed to the steroidal saponins (the bacosides). Additionally, Bacopa Monnieri is associated with preventing beta-amyloid pigmentation build-up and may be a therapeutic approach to Alzheimer's. It may decrease beta-amyloid pigmentation through controlling oxidation (from lipids, metals, and ROS) and inhibiting lipoxygenase activity. It is dose dependent, and 100mcg ethanolic extract of Bacopa Monnieri is about as potent as 58mcg Vitamin E.
Despite the traditional usage for Anxiety and Depression, minimal human studies exist; persons over the age of 65 taking 300mg Bacopa Monnieri (55% Bacosides) experienced a decrease in both anxiety and depression in a double-blinded study although 450mg of Bacopa for 3 months in otherwise healthy males with no baseline anxiety failed to find a significant effect. Bacopa Monnieri has been implicated in increasing cerebral blood flow independent of overall blood pressure at a dose of 40mg/kg bodyweight in rats; it can also decrease blood pressure (both systolic and diastolic) independent of heart rate via vasodilation, and appear to be related to Bacoside A3 and Bacopaside II. It appears to be involved in releasing nitric oxide from the endothelium. Bacopa Monnieri appears to have antinocioreceptive properties at high doses (80-160mg/kg bodyweight in rats, aqueous extract). These effects are inhibited by yohimbine HCl, atenolol, and Cyproheptadine; showing that Bacopa's antinocioreceptive effects at high doses seem to be mediated through a combination of opiodergic, serotonergic, and adrenergic mechanisms. Bacopa Monnieri has traditionally been given to children to boost brain power, alongside Gotu Kola and mixed with some milk. Out of all the human evidence on Bacopa, the one study currently looking at children is too confounded with other herbs to answer research questions on Bacopa but did not show any signs of toxicity. Another study cited here yet not indexed in Medline suggests that 350mg crude bacopa daily improved reaction times, memory, and general cognition relative to placebo. In studies on pre-pubertal animals, mice fed Bacopa at 0.5-1% of the diet (highest dose that mice would eat) for 4 weeks showed increases in anti-oxidant defense enzymes (Catalase by 26%, Glutathoine Peroxidase by 22%, SOD by 21%) and reduced levels of pro-oxidant compounds like MDA (15-21%) ROS (18-25%) and hydroperoxide (34-40%); these reductions in oxidants occurred in the cytosol and the mitochondria of tested neurons. The neurons were protected from toxic insult by 3-NPA, and no noticeable toxicity was noted in these mice. The memory-enhancing effects were also seen when orally administered to 10-day old rat pups at 20, 40, and 80mg/kg bodyweight with the extract at near 10% Bacosides A and B for 6 weeks were able to increase memorization of maze patterns and improve cognition more than controls, but 40mg/kg was needed at minimum as 20mg/kg was not statistically significant. At an oral dose of 20-100mg/kg bodyweight in rats, Bacopa Monnieri extract does not significantly influence blood glucose. One study noted that Bacosine, a compound in Bacopa Monnieri that is not one of the standard Bacosides (A and B) might have insulin mimetic properties. Oral intake of 10-25mg/kg bodyweight Bacosine (not whole bacopa) in alloxan-induced diabetic rats only, with no changes in non-diabetic rats. Subsequently, this reduced levels of MDA (from alloxan) and hemoglobin glycosylation (from oxidation), the latter with an IC50 of 7.44ug/mL which is comparable to alpha-tocopherol, the main Vitamin E molecule. These latter effects are attributed to Bacopa's anti-oxidant ability. The effects of Bacosine acting like insulin may be dependent on either diabetes, or on higher than basal blood sugar (as the cited study was performed in a fasted state). Regardless, Bacosine is around a 0.12% concentration by weight in the dry leaves, making an oral dose of 10-25mg/kg bodyweight highly unlikely. At 250mg/kg bodyweight oral ingestion of Bacopa Monnieri in mice for up to 56 days, no significant effects on testosterone levels are observed. A 50% ethanolic extract of Bacopa Monnieri at an oral dose of 200mg/kg daily for 15 days resulted in a 42% increase in serum T4 hormone concentration (with T3 not being significantly affected) which was a similar increase observed with 1,000mg/kg Aegle marmelos although the latter was associated with a sharp decrease of T3; the Aloe vera group at 150mg/kg experienced a decrease, while the increase of T4 by Bacopa Monnieri was significantly less than the active control of 0.5mg/kg T4 itself (165% increase in T4; 50% increase in T3). A study on male mice with 250mg/kg bodyweight Bacopa noted that it was able to transiently suppress fertility when it was being taken over 28 and 56 days (two times points of testing), sperm parameters appeared to be unanimously depressed. When measured in the cauda epididymidis, reductions were seen in sperm motility (56% of control), spermatozoa count (54% of control), and viability (58% of control); the number of histologically abnormal spermatozoa increased significantly by 2.6 fold. Interestingly, Libido was unaffected and testosterone was not adversely affected either, and although all effects were seen at the first measurement period at 28 days, all parameters normalized 56 days after treatment (only tested period). These effects on sperm are similar to what is seen with Curcuma Longa (source of Curcumin) at 600mg/kg, suggesting the two may be complementary in being anti-fertility agents. Bacopa Monnieri, at 125mg (45% Bacosides) has been implicated in working synergistically with one of the four (or more) following ingredients. Curcumin, Green Tea catechins (specifically EGCG), Ashwagandha and Milk Thistle (specifically, Silymarin) at 75mg (95% pure), 75mg (98% polyphenols, 45% EGCG) 150mg, and 225mg (70-80mg silymarins); respectively. They components act in a dose-dependent manner, and at a concentration of 20ug/mL only curcumin was significantly different from baseline in isolation when looking at Heme-Oxygenase 1 promoter activity (at approximately 400% of baseline) whereas Prostandim at the same concentration was at 900% baseline. Induction of HO-1 was 10-fold in Prostandim relative to 2-fold in curcumin and non-significant in the other molecules. Removal of either Ashwagandha, Bacopa, and Green tea resulted in 25-40% reductions in HO-1 promoter activity whereas more dramatic reductions were seen after removal of curcumin or silymarins. The results appear to be mediated through nuclear translocation of NRF2 and unbinding from KEAP1. This study was partially funded by Protandim's parent company, LifeVantage Corp. So, there is synergism amongst these nutrients somehow. No clue exactly which ones and by what mechanisms. Bacopa seems to be lesser important than the other ingredients though. Yohimbine is able to antagonize the A2-adrenergic receptor, which appears to be one method by which Bacopa can dull the perception of pain at high doses. Thus Yohimbine appears to antagonize the antinocioreceptive effects of Bacopa Monnieri. A nutrient interaction borne from conjecture (ie. not been tested in a study yet), but due to the ability of Bacopa to hinder spikes of dopamine in the striatum above baseline levels Bacopa may interfere with some cognitive aspects of caffeine that are experienced by naive users. Adenosine antagonism and the anti-sleep effects should not be affected. Perment is a brand name for 500mg of four herbs of Ayurveda in equal (125mg) parts; Bacopa Monnieri, Ashwagandha, Clitoria ternatea, and Asparagus racemosus; touted to be synergistic with each other in at least one (independent) study. In an animal model of Chronic unpredictable manageable stress (which effectively induces anxiety and depression), the Perment ratio was administered at 75, 150, and 300mg/kg bodyweight for 21 days alongside stressors was able to negate stress-eating (no dose-response), was about as potent than Diazepam (2mg/kg) at normalizing neurotransmitter levels, and less potent at reducing anxiety. Perment appeared to be more catered towards anti-depressive effects than anti-anxiety effects in this study, and no evidence was put forward for synergism between the molecules. Animal studies have used doses up to 80mg/kg bodyweight for up to 8 weeks and noted no biochemical side effects. One study used 250mg/kg bodyweight and did not note any metabolic abnormalities (although did not actively seek them out either) whereas another study using this same dose (250mg/kg) daily in male mice for 56 days noted no significant health effects, but did notice anti-fertility actions by impairing sperm function, which was reversed 56 days after cessation of Bacopa. One study using 300mg daily in older adults noted more gastrointestinal side-effects (cramping and nausea) than placebo. Other studies also note upset stomachs that are routinely different than placebo and one study noted increased diarrhea. At this moment in time, these remain the only adverse effect noted in humans. No significant case studies exist. ^ a b Neuropsychopharmacological effects of the Ayurvedic nootropic Bacopa monniera Linn. (Brahmi). ^ Determination of Saponin Glycosides in Bacopa monnieri by Reversed Phase High Performance Liquid Chromatography. ^ Inhibition of pro-inflammatory mediators: role of Bacopa monniera (L.) Wettst. ^ Efficacy of Bacopa Monnieri in Revitalizing Intellectual Functions in Children. ^ Relative efficacy of three medicinal plant extracts in the alteration of thyroid hormone concentrations in male mice.